In performing the work to produce the current values through winter 2018 for the Actuaries Climate Index® (ACI) and its six components, the American Academy of Actuaries (Academy), Casualty Actuarial Society (CAS), Canadian Institute of Actuaries (CIA), and Society of Actuaries (SOA) relied upon methodology developed in collaboration with Solterra Solutions and data and information from a number of publicly available data sources: the National Oceanic and Atmospheric Administration (NOAA), CLIMDEX1, and Permanent Service for Mean Sea Level. We reviewed the data and information provided for reasonableness but did not perform detailed audits. We have, therefore, relied upon each of these sources to provide accurate and complete data and information. 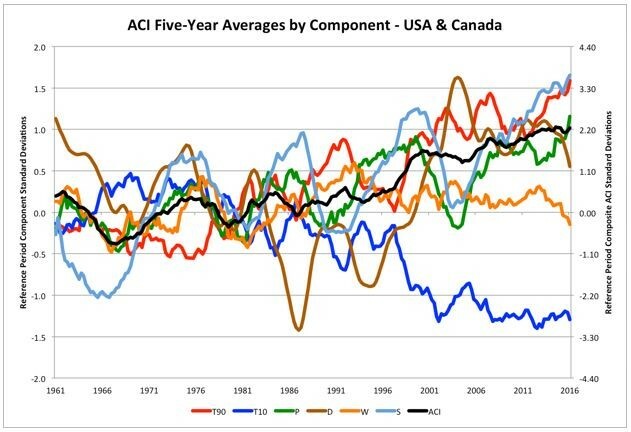 The underlying data for the ACI and its six components is based on measurements from an extensive network of meteorological stations and coastal tide stations within the United States (excluding Hawaii and unincorporated United States territories) and Canada. Some of the ACI data source providers have analyzed meteorological station observations to produce gridded data sets. For all ACI components except sea level, 2.5 degree latitude by 2.5 degree longitude grid data is used to develop ACI values. The grid data and sea level station data are used to develop monthly and seasonal regional time series beginning in 1961 for the ACI and its components. In reviewing the underlying data, we noted that not all grids and sea level stations had observational data for every month or season in the time series under study—potentially impacting the accuracy of the analysis and results for the ACI and its components. Missing data is more common in the most recent months or seasons because the data used for the ACI and its components may not be updated to reflect the most recent station observations. For sea level, because those stations included in the analysis are sparser than the meteorological stations used to produce the grid data for the other components, values for missing data are estimated by interpolation and extrapolation. For contiguous US regions, there are few data holes, and data quality is consistent over time. Given the large number of measurements from meteorological stations for these regions, it is reasonable to expect little impact to the ACI and its components due to the missing data. Alaska (ALA) is unique in comparison to the other US regions, as the number of station observations changes by season. Missing values vary by latitude. Missing values become more prevalent the further north one goes. Therefore, data quality for Canada is poorer than the US. For Canadian regions, data holes impact data quality for consecutive dry days (CDD), heavy precipitation (Rx5day), T10, and T90 (T=temperature) components with the amount of grid points declining across time. More frequent data holes begin in 2014. For example, for Canada as a whole, the number of valid temperature grid points in July 2017 is merely 56 percent of the number in July 1961. The corresponding value for the Central Arctic (CAR) region is just 17 percent. As a result, the lack of data in recent years may potentially distort ACI results. An example is the December 2016 monthly value for the precipitation component. Distortions also appear to be occurring for the Northwest Pacific (NWP) region for precipitation. NWP ACI values for precipitation have shown a significant upward movement in recent seasons as compared to past seasons. Completed analysis indicates data holes probably contributed to the increasing values. Historical results for the ACI and its components may change with each website update because the underlying data may change. Data values may be updated by third parties, not only for recent months and years, but also for prior time periods. In addition, historical results for the ACI and its components may change with each website update due to changes in the underlying methodology for determining these results. Sea level data for 2017 for the majority of Canadian stations was available from the Permanent Service for Mean Sea Level. Prior to this release, data was available only to the end of 2016, and 2017 sea level data had been estimated. Therefore, in comparing the ACI results from this release to the previous release, there are noticeable differences for the majority of Canadian regions for 2017. The current US sea level data set remains the same as that used in the previous release, as no data updates for the US stations used in the ACI were available from the Permanent Service for Mean Sea Level. The current US and Canadian data sets end in December 2017. Note that the scale of the ACI is in standard deviations for each component. Therefore, a component index value of 1.0 indicates that the index is one standard deviation above the mean value of that index during the reference period, based on the reference period standard deviation. As an example, consider the temperature component T90, which describes the upper tail of the distribution of daily temperatures. Assuming temperatures (and also the exceedances represented by T10 and T90) are normally distributed, about one-third of the time one expects that T90std will be outside the interval ±1, and one-sixth of the time it will be greater than +1. But if it exceeds +2, this is indicative of a rare event, because it is expected only 2.5 percent of the time. Values exceeding +3 are very rare, and expected only approximately 0.125 percent of the time. Hence, the value of T90std is a direct reflection of the rarity of the events it tracks. The composite index and its five-year rolling average are also shown on the same scale in the website graphs and documentation, for ease of comparison with the component indices, but the standard deviation for the composite is approximately 0.45 (depending on region). The lower standard deviation of the composite index results from its construction as the mean of the six components, which has the effect of lowering the variability of the composite relative to the variability of the components. The graph below illustrates this effect by showing two y-axis scales: standard deviations for the composite ACI should be read from the scale on the right and component standard deviations should be read from the left to properly assess the rarity or likelihood of index values being at a given level. Stated differently, because the composite index is calculated as the mean of the components, its values should be read from the left scale—but its standard deviations, for purposes of determining likelihood, should be read from the right scale. The Academy, CAS, CIA, and SOA continue to explore ways to enhance the ACI and its components, which could impact historical results. Therefore, historical ACI results may change with each website update due to the implementation of a new data source or application of a new methodology/technique for the analysis of the ACI and its components. Comparing and contrasting various methodologies for addressing missing data in the analysis for the ACI and its components, such as the NWP region for precipitation and the CAR region for all components. Investigating new data sources for sea level, consecutive dry days CDD, Rx5day, and high wind (WP90). i. Central East Atlantic for wind power (WP), which has been a significant downward outlier in recent years. Investigating alternative CDD methodology or other drought data sources/indicators. The input data for this component are on an annual basis and are not as robust as what would be provided by a more frequently updated data source. Monthly CDD results are approximated by linear interpolation of the annual values. After the initial release in November 2016, a change was made to the methodology for producing the standardized anomalies for this component to more accurately reflect the variation found in the base period data. In the initial release, a separate reference period mean and standard deviation were calculated for each month, based on the 30 values for that month in the reference period. In the current methodology, the reference period mean and standard deviation are based on the 360 monthly CDD values. Investigating alternative methodologies for determining ACI regional values including regions USA, CAN, and USC (both countries combined). The sea level component excludes the impact of land motion. The impact of land motion on sea levels will be investigated. There is currently no sea level index for the Midwest (which has no ocean coastline) and Canadian Arctic (which has no historically reliable tide stations) regions. Proxies may be considered for these regions in the future but the overall ACI and country-level indices would not be affected. 1CLIMDEX (Datasets for Indices of Extreme Weather) is developed and maintained by researchers at the Climate Change Research Centre (CCRC), The University of New South Wales (UNSW) and funded by the Australian Research Council and the Australian Department of Climate Change and Energy Efficiency through Linkage project LP100200690 and in collaboration with the University of Melbourne, Climate Research Division (Environment Canada) and NOAA’s National Climatic Data Center (USA). See also: Expert Team on Climate Change Detection and Indices at the World Meteorological Organization.